Laser Hair Removal destroys the hair follicle using controlled, yet powerful, pulses of light. The pigment in the hair follicle absorbs the light projected by the laser and the intense heat destroys it. This heating is virtually painless. In order to obtain the best results with laser hair removal, it is important to use a laser suitable for your skin type. BodyLase® has multiple FDA-approved lasers for all skin colors. Most people require six to eight sessions of Laser Hair Removal. The laser kills the unwanted hair while it is in an active growth phase. On any given day, you are actively growing about 10-15 percent of your hair. Because of this, you will need 6-8 treatments spaced apart 6-8 weeks to reduce your unwanted hair. BodyLase® promises that at the end of your treatments, you will see a significant reduction in your unwanted hair. To find out more about Laser Hair Removal, schedule a no obligation consultation with a BodyLase® Laser Hair Removal Expert. She will assess the areas of concern and recommend the best program to make you hair free for life! You will talk about the Laser Hair Removal process and she will answer all of your questions. If you would like to start you Laser Hair Removal the same day as your consultation, you can! We offer pay-as-you-go options, but most patients find a Laser Hair Removal Package to be the best way to fit any budget. Laser Hair Removal targets the melanin or pigment in the hair. Therefore, the more melanin in your hair, the more effective laser hair removal will be. Someone with gray, red, or blonde hair is not an ideal candidate. If you have dark hair, regardless of your skin color, BodyLase® can effectively remove your hair. Laser hair removal is fast, completely non-invasive and the most effective method for long-term hair reduction. * Laser Hair Removal is the best way to treat a condition called Pseudofolliculitis. This is a condition where bumps appear in an area where there is typically coarse, curly hair, such as the bikini line. This condition improves very rapidly following laser hair removal. In fact, after only one laser treatment pseudofolliculitis can improve tremendously even though all of the hair is not yet removed. BodyLase® has helped many patients with this condition with much success. What are the limitations/disadvantages of Laser Hair Removal? Possible side effects, though very rare, may include: burns, redness and swelling, and dry or irritated skin in the treated area. Most side-effects tend to be temporary and resolve over time. Another possible side effect is simply it does not work. This side effect is extremely rare, and happens to less than 1% of the population. Laser Hair Removal is also not as effective on unpigmented (gray) hairs and red or blonde hair. This is a limitation of ALL laser hair removal devices. And finally, since hair growth is driven by hormonal changes, ethnic background, and sometimes medical conditions, it is possible to need additional treatments once or twice a year, and that’s why we offer our BodyLase® Lifetime Guarantee! What areas can be treated with laser? BodyLase® can remove hair from any part of the body, except underneath the eyebrows. This area is too close to the eye and is not safe to treat with a laser . The most commonly requested areas requested are the face, upper lip, neck, chest, underarms, back, abdomen, bikini line, and legs, where unwanted hair can be not only unsightly and embarrassing, but irritating, difficult and time consuming to remove with shaving. The sensations associated with laser hair removal vary considerably between individuals, and is a function of your skin type, the thickness and density of your hair, the body part being treated, and your own sensitivity to discomfort. Most people describe Laser Hair removal as a pinching, stinging or tingling sensation. At BodyLase®, we try and make the treatments as comfortable and easy as possible. The FDA defines permanent hair removal as an “85% reduction in unwanted hair”. 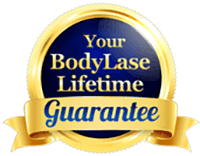 At BodyLase® it is important to us that we meet your expectations. Some patients may find that maintenance sessions done once or twice a year are ideal for keeping any tiny small “stragglers” away after completing the initial 6-8 treatments. At BodyLase®, your satisfaction is our goal. We are here to keep you hair free for life. Shave the area to be treated the day of your treatment. The laser targets the hair follicle and any excess growth will spark and smoke, and could potentially cause a superficial skin burn. Bleaching or plucking should be stopped 2-4 weeks before the treatment. Shaving between your treatments is ideal. What Should expect after my Laser Hair Removal treatment? Be aware that your hair will continue to shed up to three weeks after your treatment. You can help the hairs come out by using a loofah or gentle washcloth. No picking the at the hairs! In most cases, there are no long-term side effects associated with the Laser Hair Removal. However, pigment changes of the skin treated can occur. Using proper sun protection and a laser appropriate for your skin type will dramatically reduce the risk of pigment changes. Pigment changes may persist for months, but are almost always temporary. Blisters and burns are rare, but can occasionally occur. Should anything not feel or look right after your treatment, call BodyLase® and we can assist right away. How does skin color affect the results? Laser hair removal must be individualized for each patient. Your skin type, the body part being treated, and hair quality, are all factors affecting your results. With our experience, BodyLase® can achieve effective laser hair removal on all skin types. We will use only a laser that is suitable to your skin type. What to expect during the laser hair removal procedure? During the procedure, you are placed in a comfortable position, and may change into a robe if you wish. You wear special goggles to protect your eyes from the laser light. Your treatment provider will mark the area with a white pencil to insure the entire area is being treated. You will hear the “beep” from the laser during the treatment. You may notice the odor of singed hair, which is normal. Afterwards, you may experience some temporary redness and slight swelling. You may also sense the heat of the laser for a few hours after the treatment.